I always take time to reflect on the past year and look to the new year for renewal. This past year so much has happened that I am truly grateful for. My toastmasters club (Open Door Toastmasters) elected me club President for the 2017-2018 year, I became Area Director (for 5 Toastmasters clubs in District 83), and got married to my longtime friend and college classmate, Michael. I'm also thankful for my parents and good friends who always supported me. 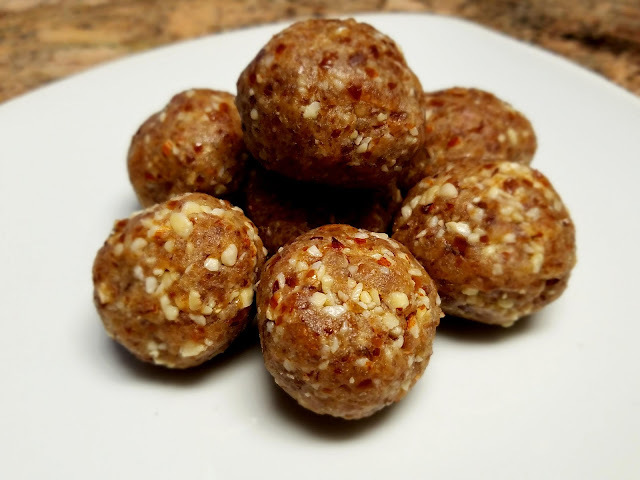 We wanted to start off the new year with a healthy, sweet treat: Date and Almond Laddu (balls). Below are the ingredients and instructions on how to make this yummy treat; enjoy anytime of the year. In a food processor, add dates, almonds and blend them coarsely (approx. 6 to 8 pulses). Next add mava powder, ghee and vanilla extract. Pulse again 3 to 4 times until all ingredients are blended well. Remove the mixture from the jar and make 1" round balls or laddu. Mixture makes about 15 to 18 laddus. 1) If desired, roll the laddus in dry coconut. Food coloring can be added to the coconut powder for festive appeal. 2) If milk mava powder is not readily available, you can also use coconut milk powder. Wishing all a very happy and prosperous new year. How did you celebrate the new year? Please share your stories with us.